Andrew Dickos spins a good web for film noir addicts in Street with No Name. 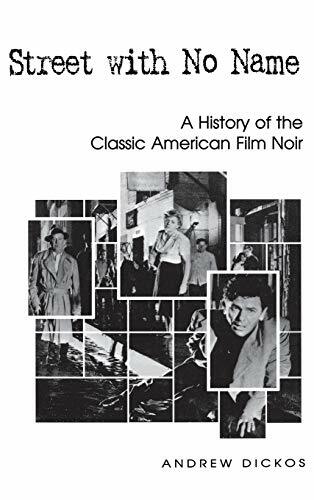 Although the book is subtitled, &#147;A History of the Classic American Film Noir,&#148; the book&#146;s actual contents are somewhat broader. Dickos&#146;s contention is that the earliest antecedent of film noir is to be found in post-war German Expressionism, imported to the United States by such figures as Fritz Lang, Robert Siodmake, Otto Preminger and Wilhelm Dieterle, all of whom immigrated to the U.S. with &#147;sensibilities shaped by the ruder realities of life experienced during the worldwide Depression and the rise of Nazism,&#148; and used their artistry &#147;to circumvent the sunny optimism promulgated by Hollywood and fashion a subversive kind of genre that spoke to an American audience.&#148; Although Dickos acknowledges the influence of the French screen of the 1930s in the work of directors like Marcel Carne, Jean Renoir and Pierre Chenal, he contends that it was the blend of the German imported talent with a depression and war-disallusioned American public that created the specific circumstances necessary for film noir. The point is arguable. Film noir&#146;s American beginnings have often been attributed to the 1940s detective novels of figures like Raymond Chandler and Cornell Woolrich, and as far back as the &#147;gangster&#148; films beginning with Von Sternberg&#146;s Underworld (1927), to which Dickos gives but fleeting recognition. This premise is competently traced through chapter sub-categories such as, &#147;The Private Detective,&#148; &#147;Violence in the Noir,&#148; &#147;Sexuality in the Noir,&#148; and &#147;Families in the Noir.&#148; Considerable time is also devoted to the development of techniques that noir enthusiasts love most: chiaroscuro, voice-over narration, and flashback as a story-telling device. Dickos writes on this subject with clean and intriguing prose, and the book is a good read. Recommended especially for film buffs.